Seven members of the pop group Now United’ pose for a photo in a studio in Yongsan-gu, Seoul, on July 12. The pop sensation Now United arrived in Korea on July 6, the seventh country on its world tour. With 14 members, all both dancers & singers and all from different countries, Now United is a truly global group created by Simon Fuller, the person behind the Spice Girls, and managed by XIX Entertainment. Korea.net met with Now United on July 12 to hear about its experiences in Korea. What are your impressions of Korea in general? Any: Okay, so when I first got here to Korea, I was so excited, because it was my first time in Asia. After I arrived in Korea, I looked around, and it actually looked just like my city in Brazil. I thought, "Oh my god, I feel like home." But then at night, I saw all the city lights, and that was when I felt that it was a thousand times better than my city. What are your impressions of K-pop? Krystian: (Everyone looks at Krystian, right after the question.) Okay, what should we talk about? Yeah, I’m a big K-pop fan. I think it inspires me a lot as an Asian artist. Specifically, I recently listen to BTS and Blackpink a lot. They're really breaking into the scene. I think for BTS, the music really catches Western people, and Blackpink… it's just everything. Noah: I love the styles of K-pop stars. The music videos here in Korea are also incredible. I’m just so blown away. I could watch them all day. So entertaining, so fun. What did you experience in Korea? Sabina: The first day when we arrived here in Korea, we went to a convenience store, because it was open all night. We were hungry, and we bought these cup of instant noodles. It was so simple, yet I loved it! So right afterwards, I bought a bunch of noodles, and I’m eating noodles everyday since I got here in Korea. I’d wake up at 4 a.m. and I’d say, “Heyoon, sorry, but I’m gonna eat some noodles, right now,” because I’m in love with the noodles! Sina: I want to say, I miss German food, but I love Korean food. I also love kimchi. That’s my favorite. I could eat kimchi the whole day. It’s sort of like German Sauerkraut, maybe that’s why I don’t miss German food that much. Diarra: We went to this singing room (noraebang in Korean) for a new music video, so we had some fun there. Before we turned on the video, we had some fun having our own little party there. Noah: We also went for shopping in Hongdae. It was just so cool, because I’ve never seen anything like that before. There were so many people out and it was just fun to look at everyone and the way they dress, because I really love fashion so much. Everyone dresses so cool here, and all the stores play amazing music. I even found my favorite pants in a 1980s vintage store. I was telling Heyoon that I’m going to save a lot of money, so when we come back to Korea I can just buy everything. Sofya: You know why I love shopping here? Because the sizes here are small so they're for me. 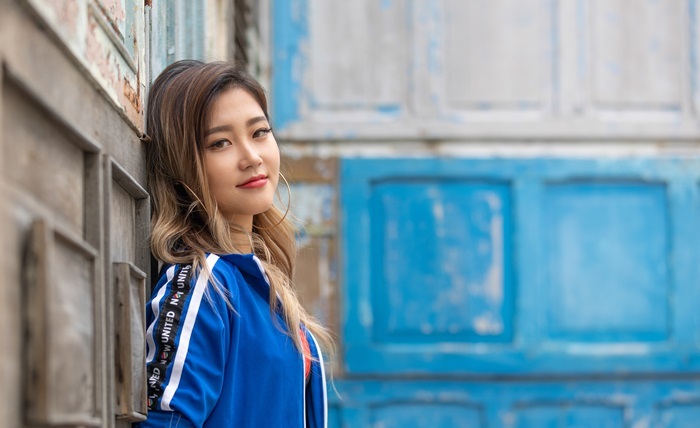 For example, in Russia, I’m always trying to look for XS, sometimes, like, XXS, and here I wear like an M or an L.
Heyoon, the Korean member of pop group Now United, pose for a photo in a studio in Yongsan-gu, Seoul, on July 12. Which things about Korea do you want to introduce your members, when you revisit Korea? Heyoon: The first thing is, I really want to take everyone to Gangnam-gu District in Seoul because they always thought about neon signs and pretty lights. But we didn’t have a chance to visit there, because of the busy schedule. Next time we’re going to come back really soon again, so I’m definitely going to take them to Gangnam to just walk around the streets and enjoy the bright night lights. And then for the girls, it's all about fashion and beauty, because it’s so amazing here. I want to introduce all the Korean cosmetics and beauty tips. One thing for the boys is internet cafes (PC bang in Korean) and group video game sessions. It’s like a video gaming room. You stay there the whole day and go crazy on games and eat noodles. We should definitely have a video game day. The pop group Now United, which features 14 singing and dancing artists from different countries, makes hearts with their fingers for a photo at a studio in Yongsan-gu, Seoul, on July 12. (Front row from left) Shivani, Sofya, Heyoon, Joalin, Sabina, Sina, Diarra. (Back row from left) Noah, Josh, Any, Krystian, Bailey, Hina.